In The Skeptical Environmentalist Bjorn Lomborg challenges widely held beliefs that the global environment is progressively getting worse. Using statistical information from internationally recognized research institutes, Lomborg systematically examines a range of major environmental issues and documents that the global environment has actually improved. He supports his argument with over 2900 footnotes, allowing discerning readers to check his sources. ... probably the most important book on the environment ever written. The Skeptical Environmentalist is the most significant work on the environment since the appearance of its polar opposite, Rachel Carson's Silent Spring, in 1962. It's a magnificent achievement. 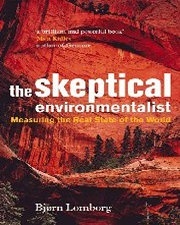 The Skeptical Environmentalist: Measuring the Real State of the World. Cambridge University Press, 2001, 540 pages.